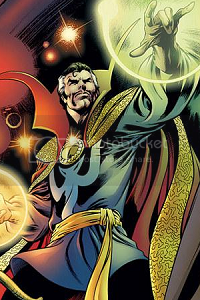 Sorcerer Supreme vs. Father of Asgard! The winner of this match will face either Superman or Jean Grey in the Final Four. Voting closes Saturday, June 10th at midnight EDT. One God Down, One To Go ! This one is a really tough call for me. Marvel's own databases have repeatedly called Odin perhaps the mightiest mythological god still active today, in Asgard or elsewhere. But as I mentioned on Dr. Strange's last tournament thread, outmaneuvering more powerful supernatural entities is Strange's stock in trade. His sorcerous skill and shrewd insights usually let him find an exploitable physical or mental weakness in his foes. 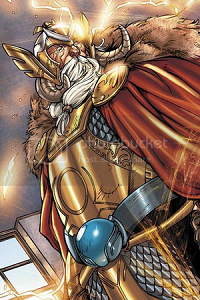 OTOH Odin is a cunning and subtle old god, very hard to out-think or catch off guard. He's also a powerful physical combatant, a level Strange rarely fights on. Steven is a skilled martial artist, but that's not his strongest suit. If the fight were taking place in Asgard the outcome would be a foregone conclusion. Here in Subterranea the setting favors neither combatant. Taking all factors into account, I would still give it to Odin. Odin sees all and defeats Dr. Strange!